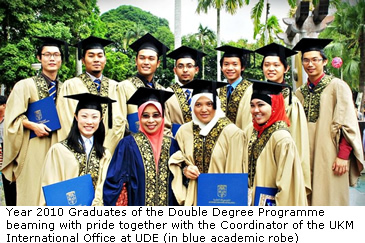 BANGI, 20 August, 2010 – Double degree graduates from the UKM and University Duisburg-Essen, Germany (UDE) collaboration are highly sought after by employers as they are grabbed almost immediately upon graduation. All the 48 graduates under the programme since 2003 were able to find jobs quickly after graduation with a sizeable number of them employed by multinational companies in Malaysia as well as in Singapore, Germany and Algeria. Others work for local engineering companies in Malaysia, two are self-employed and one works in a government agency. At least four are currently pursuing higher degrees locally and abroad. Those who opted to work overseas find it helpful to have both Malaysian and German qualifications especially when job hunting. The programme began in 2000 had enabled engineering students from UKM to graduate with degrees from both UKM and UDE. 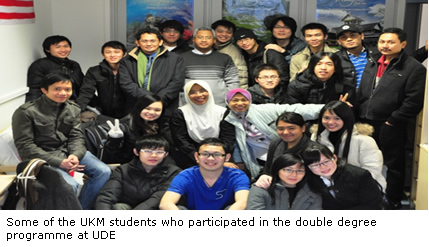 To date a total of 62 UKM students had benefitted from the programme. Students who are interested must have excellent academic results of at least 3.0 CGPA during their third year. Those selected will have to take up German for at least 300 hours before leaving for Duisburg. With funding from the German Academic Exchange Services (DAAD), students who take part in the programme are from three departments in UKM’s Faculty of Engineering and Built Environment, namely the Departments of Electrical and Electronics Engineering, Mechanical and Materials Engineering and Civil and Structural Engineering. “The students value the experience of studying in a foreign country such as Germany where the engineering prowess of the Germans is renowned worldwide,” Dr Andanastuti said. Despite difficulties of mastering the German language, the students found that it was an advantage to know a new language when pursuing their first degree. Each student is given RM10,000 for the whole duration of their study in Duisberg-Essen. Dr Andanastuti said Muslim students do not face any problems as the town has a large community of Turkish descendants. Besides the availability of halal food there are many mosques there. Rice is also easily available. Another batch of 16 students will leave for UDE in October 2010. Half of them are from the Department of Electrical, Electronics and System Engineering. They are currently completing their third year in UKM before flying off to Duisburg to complete their undergraduate study. Students from UKM spend between 12 to 18 months in UDE to complete their final two semesters and some industrial training. Courses are compared and were made equivalent for credit transfers. UKM also received students from UDE but most of them are in UKM for a shorter period of time as exchange students (rather than as double degree students). In 2005, three students from UDE joined UKM’s undergraduate programme whilst four others joined as post graduate students. All of them completed their stints in UKM in 2006. Apart from the double degree programme, the partnership with UDE has evolved to include several academic staff exchanges. A steady stream of academics from UKM has been appointed guest lecturers at UDE, beginning with Prof Ir. Dr Abd Halim Shamsuddin (summer semester 2002), followed by Prof Dr Mahamod Ismail (summer semester 2003), Prof Dr Mohd Alauddin Mohd Ali (summer semester 2004), Prof Dr Ir Nik Abdullah Nik Mohamed (winter semester 2004/2005), Prof Dr Jaafar Sahari (winter semester 2005/2006) and more recently Assoc Prof Dr Andanastuti Muchtar (winter semester 2007/2008 and summer semester 2008). Most of the previous appointments were short-term, with UKM lecturers spending one semester in UDE except for Dr Andanastuti who went for a one year sojourn. Additionally, joint research work have also been initiated for example in the fields of waste water treatment, computer and software engineering, information technology, power engineering, inter cultural communications, employability and personality development, smart materials, advanced materials, transportation engineering, fuel cell and renewable energy (biogas and biohydrogen). Work on the setting up of the UKM office in Duisburg began in November 2009 and opened on 22nd Feb 2010 with the official signing ceremony of an LOI between the Mechanical Engineering Departments of both UDE and UKM. The establishment of the international UKM office at UDE is expected to give UKM higher visibility in world academia particularly in Europe. More research collaboration can also be expected with other universities. Such partnership will not be exclusive to engineering, but extended to other fields and would be in line with UKM’s image as “the national university with an international reach”.